World War II veteran William Dunsmore was on hand Monday to unveil a parking spot at City Hall that is now reserved for Purple Heart recipients. Dunsmore, who has a Purple Heart, was in the first wave of soldiers to reach the Normandy beaches on D-Day. He lives at the Nevada State Veterans Home. 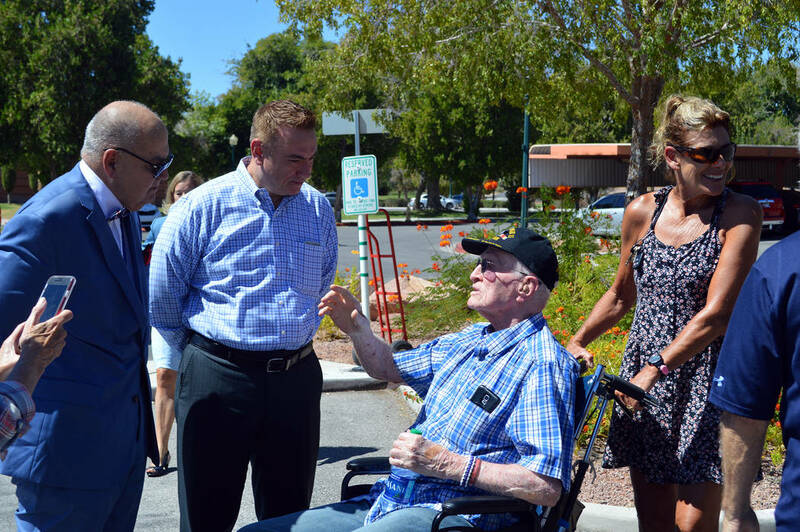 Celia Shortt Goodyear/Boulder City Review City Councilman Warren Harhay, from left, and City Manager Al Noyola listen to World War II veteran William Dunsmore, who is being helped by his granddaughter Lori Dunsmore, talk about his time in the United States Navy. They were on hand Monday, Sept. 17, to help unveil a parking spot at City Hall that is reserved for Purple Heart recipients, those wounded in combat. Another spot has been reserved at the Senior Center of Boulder City. 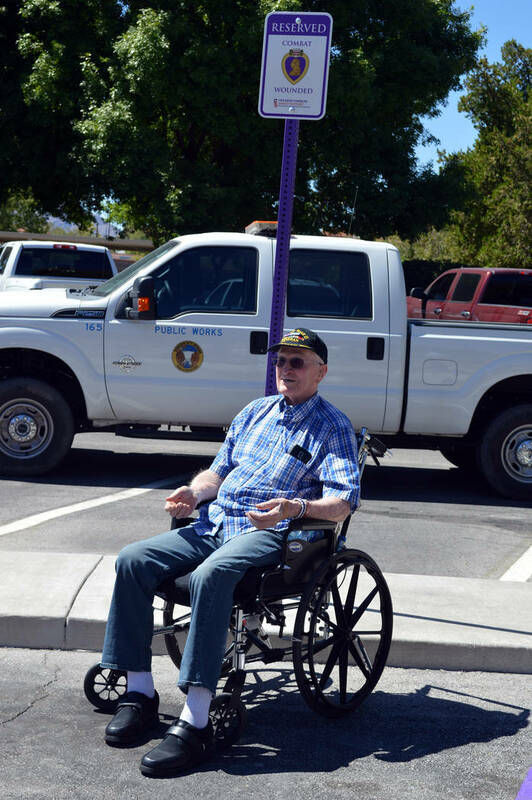 Celia Shortt Goodyear/Boulder City Review World War II veteran William Dunsmore was on hand Monday, Sept. 17, to unveil a parking spot at City Hall, 401 California Ave., that is now reserved for Purple Heart recipients. Dunsmore, who has a Purple Heart, was in the first wave of soldiers on Normandy beach on D-Day. He lives at the Nevada State Veterans Home in town. From left, City Councilman Warren Harhay and City Manager Al Noyola listen to World War II veteran William Dunsmore, who is being helped by his granddaughter Lori Dunsmore, talk about his time in the U.S. Navy. They were on hand Monday to help unveil a parking spot at City Hall that is reserved for those who receive a Purple Heart for being wounded in combat. Another spot has been reserved at the Senior Center of Boulder City.